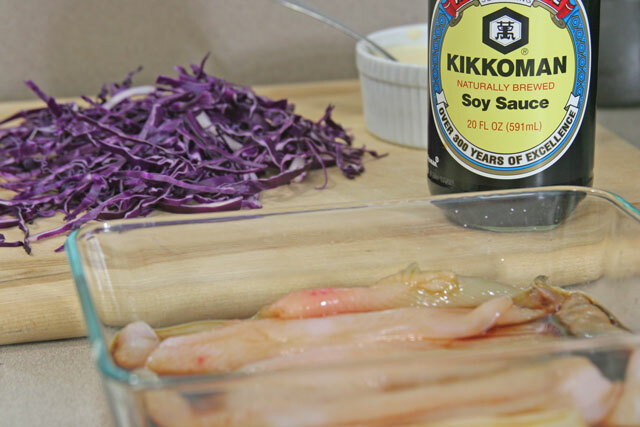 Recently I was asked by Latina Blogger Connect and Kikkoman to develop a recipe using one of their products. 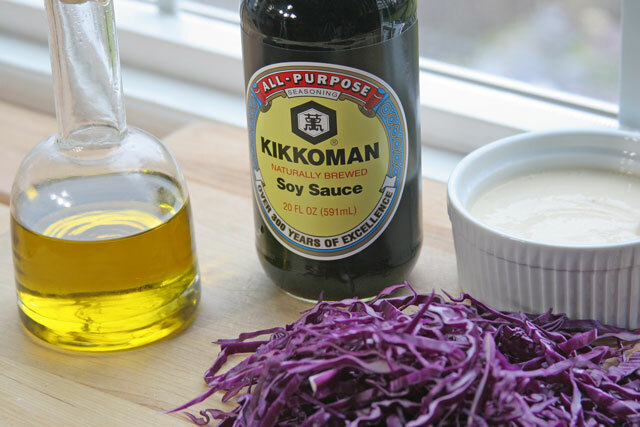 I gladly accepted the invite, as I have used Kikkoman for many years and I do think some of their products can be used in so many different ways. I got to thinking how to use these products, I chose soy sauce. I use it all of the time, and being in my Asian class right now, I have been using it even more lately. But I wanted to challenge myself a bit, and think more Mexican foods with the soy. Seeing as I was working with Latina Bloggers. I immediately came to the fish taco. I am an avid fish taco affciaonado so it was a fairly natural thought for me. This is my version of a super simple fish taco. I used the soy in different ways to season the fish and the sauce. Soy is used to season or salt many dishes in Asian cuisine, as with fish sauce and lime. They don’t always reach for the salt in every dish, yet in order to build flavor they use soy. That is where I am going with this fish taco. I obviously wanted to use usual local and seasonal products for this challenge. So I was talking to OM Seafood about their shellfish and Dave from OM sent me to Newmans Fish Market inside City Market in the Pearl District of Portland. I chose to go with a sustainable and in season Petrale Sole. Did you know fish and shellfish are seasonal? It is pretty cool stuff, you can check out Monterrey Bay Aquariums app or website called, Seafood Watch, for information pertaining to over fished, seasonal, and sustainable healthy fish. I purchased fresh fish brought in from the Washington coast this morning only a couple of hours away. It was excellent, fresh, and perfect for my fish tacos. The sweetness of the fish really shined with the saltiness of the soy. 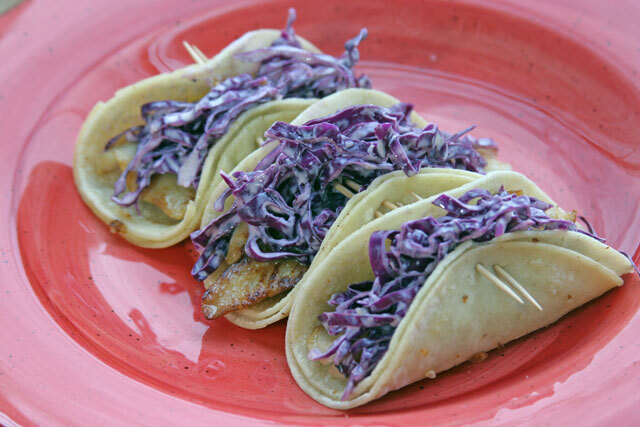 Paired with the tanginess of the yogurt and crunchiness of the cabbage, this is an all around tasty balanced taco. This recipe is simple, quick, easy, and healthy. I worked with Spanish Kikkoman and Latina Bloggers Connect on this post. This is a compensated post but all of the opinions and recipe development are ALL my own. 1. Place the fish fillets in a bowl with soy sauce. Marinate while prepping the cabbage, and sauce. Mix the 1 1/2 tablespoon soy sauce into the yogurt. Take 1/2 of the sauce and set aside for serving. Place the thinly sliced cabbage in the remaining yogurt sauce. Toss to combine. Set side. 2. Place the olive oil/grape seed oil in a large pan over medium heat. 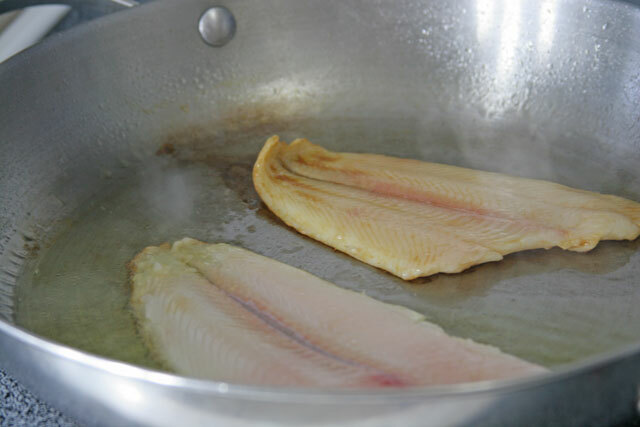 Once the oil is shiny and the pan is hot, place the fish fillets in the pan, lower the heat to medium low. Do not over crowd, cook about 3 fillets at a time. Cook for about 3-4 minutes, using a fish spatula or spatula flip the fish gently. Cook for about 3-4 minutes. Once all of the fish is cooked, lower the heat to low. 3. Place the tortillas in the pan in one layer to heat them for about 2 minutes on each side. Take the warm tortilla, place a small filet on the tortilla, put a teaspoon or so of yogurt sauce on the fillet, then add a small spoonful of the cabbage. Serve hot! I also serve this meal family style. I warm the tortillas and place them in a tortilla warmer or use a bowl lined with clean dish towels to keep the tortillas warm. Serve the cabbage and salsa in bowls, and the fish in a container with a lid to keep warm. Make each taco as you go. Serve this meal with a salad, beans, and or rice. 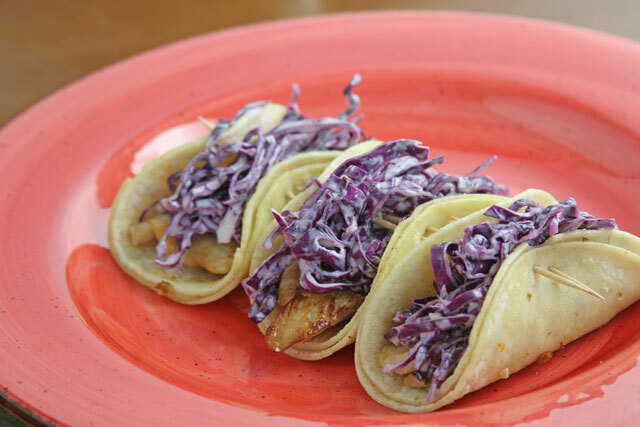 I love fish tacos, these would be perfect for taco Tuesday! It was a weird way to make them, but my challenge from the company was to use less than 6 ingredients. So I did and they turned out so good. And they are super easy to make which was nice. This looks delish! I had never thought to use purple cabbage. Such a great contrast, and crispy texture. I also love fish tacos! Thank YOU! It was quite tasty.